Christ is Risen, He is Risen indeed! He returned to the Father and sat down because His work is finished. But aren’t you glad He didn’t leave us alone? • Pray for Bonnie Jean as she recovers from a painful root canal. Pray that her recovery would be speedy and that the Lord would sustain her through the pain! 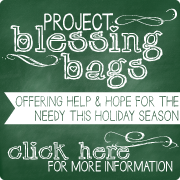 Please also continue to pray for God’s provisions as she distributes our Blessing Bags in New Jersey. She has shared that people have been blessed already! • Meredith has asked for continued prayer as she battles Lyme Disease. Her immune system is still fighting – praise God for that! Pray she will be empowered by the Holy Spirit, even as her physical body is weak. • My sweet childhood friend, Erin, has asked for prayer for her 1-year-old son, Royce. Royce had some complications at birth, including an interrupted aortic arch in his heart and bleeding on the brain. He has had a feeding tube since birth and it was recently removed. God is good and little Royce is quite a fighter! He is doing very well without the feeding tube – eating solid foods and growing! Erin is asking for prayer that Royce does not have to have surgery to close the feeding tube hole in his stomach and that it will stop leaking on its own. However, if it be the Lord’s will, pray that that surgery and a separate circumcision surgery that needs to be done would go smoothly with no complications to his heart or head. Royce was also recently taken off anti-seizure medication. Erin would also like prayers that Royce would not have any seizures and that she and her husband, Danny, would have wisdom & discernment in determining whether he could be having one. Finally, please pray for wisdom and discernment for all of Royce’s doctors in their treatment of him. Pray the Lord would clearly reveal to them what Royce needs. • Please pray for Ree. Ree was my teaching partner for many years and is like a second mother to me. We had been praying for her back in February when she fell and broke her wrist just before she was supposed to have hip replacement surgery. Her wrist is now recovered and her hip surgery will be this Wednesday. Please pray for peace and continued trust in the Lord for Ree and her husband, Joe. Pray for a skillful hand for the surgeon and a successful surgery. Ree is a faithful servant for the Lord and we need her back up on her feet quickly! • Finally, our own Deb is asking for continued prayer for her husband, Ray, as he is on the last leg of his missions trip to Malawi. Pray that the Lord will physically sustain him as it has been a whirlwind trip! Pray for God to be glorified by his remaining time there and that he will have safe and smooth travels home. So much to lay at our Lord’s feet! So thankful He is ABLE to carry our burdens!